The Golden Globes in the US this week kicked off the film and TV awards season on both sides of the Atlantic. The regular overdose of red-carpet posing and trophy-holding winners was familiar, but this year’s event was very different for a number of reasons. One was the preponderance of jokes about North Korea in the wake of the cyber attack on Sony Pictures over The Interview (more on that later). Then there was the fact that everything was overshadowed by the atrocities in Paris. Big questions about free speech and what constitutes entertainment are at stake. Online streaming companies – namely Netflix and, for the first time, Amazon – racked up a number of big wins at the Globes. TV shows produced by both received large numbers of nominations and took home some of the most prestigious trophies. These triumphs underline what amounts to a ringing endorsement of the growing power of the new online platforms. Add to this Sony’s decision to release its film The Interview (pictured) largely online, in the wake of the cyber attack and threats to the cinemas planning to screen the film, and the message was clear: online programming and distribution has arrived. It all began with the hacking of Sony Pictures’ emails in December, in what the FBI claims was an attack backed by the government of North Korea. The film’s theatrical release to a planned 2,000-3,000 cinemas on Christmas Day was cancelled following the threats. Sony moved quickly to find alternative distribution, setting up online deals initially with YouTube, Google Play, Microsoft’s Xbox and a specially created website: seetheinterview.com. More recently, Apple’s iTunes, Amazon and cable instant video services have also been selling the film. The hacked Sony emails were embarrassing for Hollywood, but the free publicity and the fact that America’s values were seen as under attack meant there was more demand than ever to see The Interview. Millions of curious people could see the film safe in their homes by either renting it for $5.99 (£3.90) or buying it for $14.99. Sony pocketed an amazing $31m in the first 13 days of online availability. A handful of independent cinemas risked showing the film, adding another $5m to the box office gross. 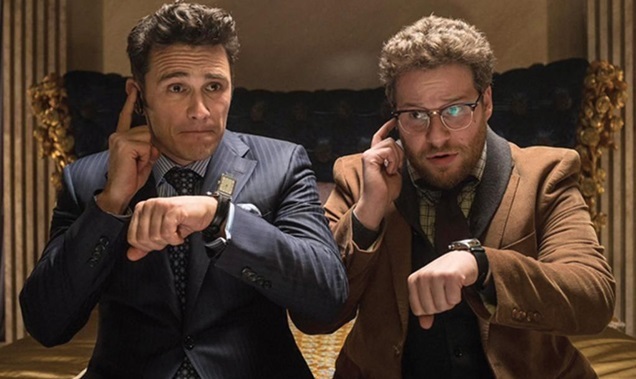 Sony has not only nearly recouped its reported initial $44m investment in The Interview, but the film has shown that online distribution can work. From a commercial perspective, watching movies and TV shows online has been given a massive boost. Buying a subscription to an online-only service looks even more attractive – especially in the US – than renewing a hefty cable TV subscription. And what’s trending in the US is coming soon to the UK. Netflix and Amazon winning Baftas is inevitable. Let’s hope that even as digital technology changes the dynamics of the entertainment business, we are also mindful about continuing to protect the values that so greatly enrich both our entertainment choices and our democracies.